Netwrix Auditor for Windows File Servers provides actionable security intelligence about all changes made to files, folders, shares and permissions; file access auditing; data discovery and classification; and file analysis reporting for improved data security and information management. Enables a sensitive file audit by providing information about what types of sensitive data you have, where it is located, who has access to this data and how it’s used. 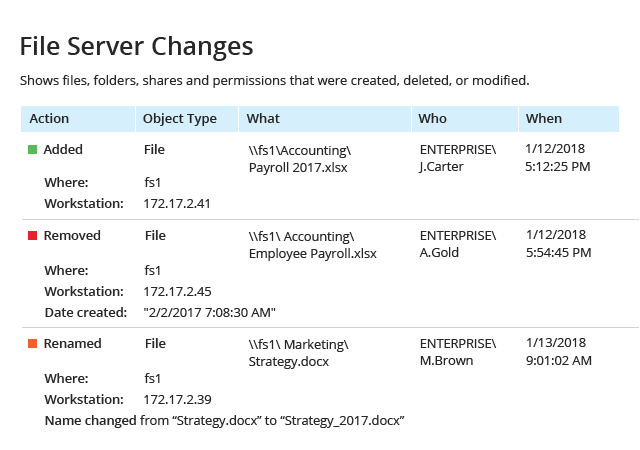 Makes it easy to track changes to your file servers by delivering insightful information about who changed what, and when and where each change was made. Helps you exercise control over data access attempts by reporting on both successful and failed read attempts across multiple Windows-based file servers and shares. Empowers you to quickly identify who has access to which files and folders, as well as spot overexposed data. 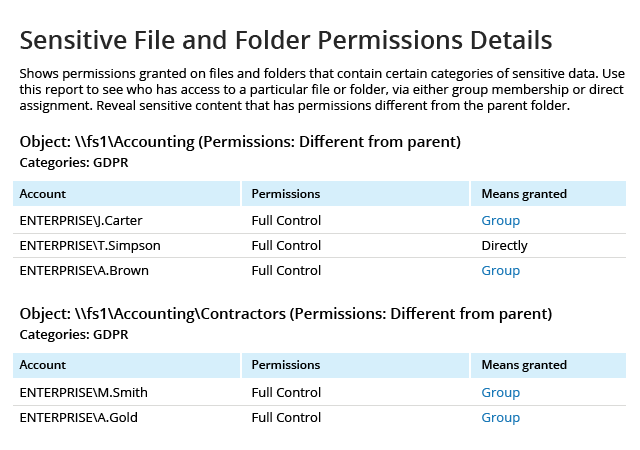 You can also easily compare the current state of effective permissions to any point in the past. Alerts you whenever there have been too many file modifications or failed access attempts in a short period of time so you can quickly respond to a ransomware attack or suspicious insider activity. Delivers detailed information on data ownership, reveals data usage and data volumes, and identifies stale and duplicate files, helping you improve data management processes. Provides out-of-the-box reports mapped to common regulatory compliance standards, including GDPR, PCI DSS, HIPAA, SOX, GLBA, FISMA/NIST, CJIS and more. Makes it easy to find the exact information you need, whether it’s the changes or access events associated with a certain user or all activity related to a particular file or folder. Helps you assess and remediate risks related to data security, such as data available to the “Everyone” group and potentially harmful files on your file servers. Identifies user accounts with abnormal activity in your file servers and other on-premises and cloud-based systems, and calculates the associated risk score for each user. Provides security intelligence about file and folder activity, including access to archived data and data access outside business hours, which might otherwise have gone unnoticed. To comply with external regulations and ensure data security, organizations must audit their Windows file servers. Performing Windows file auditing helps detect leaks and unauthorized modifications of sensitive data. 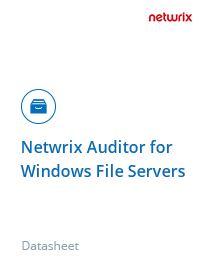 Netwrix Auditor for Windows File Servers automates file server auditing and reporting, thereby mitigating the risk of compliance failures and problems with the integrity, availability and confidentiality of data. Identify the types of sensitive data you have, where this data is stored, who has access rights to it and how it’s used. Make regular review of this information an essential part of your audit policy to ensure that permissions and changes remain in line with local security policy. Overcome the limitations of native Windows Server file auditing tools with Netwrix file server reporting software. Instead of struggling with time-consuming and error-prone manual monitoring processes, IT administrators can use Netwrix Auditor’s intelligence to keep an eye on activity on file servers. 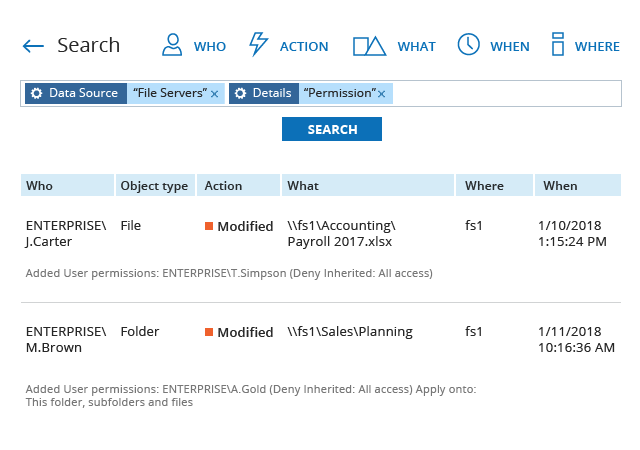 Quickly sift through the audit data to investigate suspicious additions, deletions or modifications of files and shares; changes to file and folder permissions; and file access attempts (both successful and failed). Use your findings to prevent similar incidents from occurring in the future. Support your data governance initiatives with file analysis reports. Prevent data sprawl and facilitate cleanup by spotting empty folders and duplicate or unused files. Identify the data owners and the most frequent data users to get them involved in information management decisions. Read how Netwrix Auditor for Windows File Servers can help you improve data governance, prove compliance, and ensure the integrity, availability and confidentiality of data across your Windows file servers. 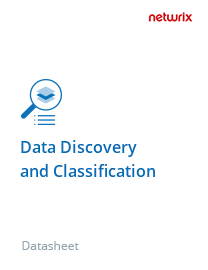 Learn more about how Netwrix Auditor’s Data Discovery and Classification can empower you to locate critical data and secure it in accordance with its value or sensitivity. TEI ensures the security of business-critical and sensitive data with Netwrix Auditor for Windows File Servers. Clackamas Fire District #1 Mitigates the Risk of Ransomware and Saves up to $190,000 per Year. The Medical Center Clinic deployed Netwrix Auditor for Windows File Servers to improve the security of electronic medical records. Pike uses Netwrix Auditor for Windows File Servers to track changes and data access across 40 file servers. "Controlling access to sensitive data is one of our priorities, since we must comply with numerous industry standards. Netwrix Auditor helps us to ensure that there is no room for unauthorized actions that could potentially compromise sensitive data and damage our customers." Netwrix Auditor for NetApp provides comprehensive auditing capabilities for your NetApp filer appliances. It enables continuous NetApp monitoring and delivers complete visibility into all events and changes across your NetApp Filer devices. Netwrix Auditor for NetApp automatically collects audit data and stores it in a reliable two-tiered storage. 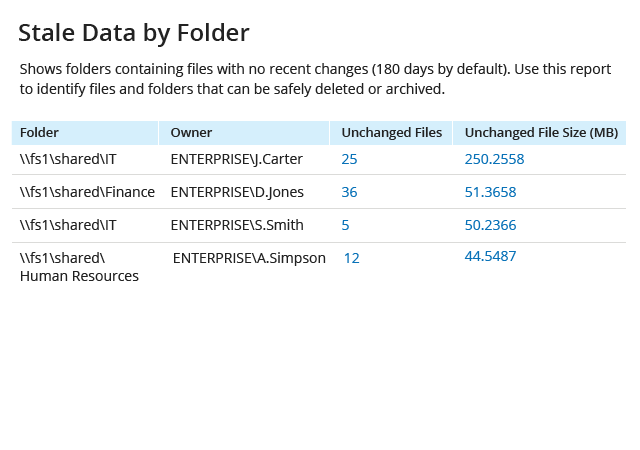 Easy-to-understand reports provide complete details about who made file, folder and permission changes, and when and where each change happened. Other reports identify who attempted to access protected objects on NetApp filer devices and whether the attempt succeeded or failed. Information workers rely on file servers and storage devices for accessing critical files: HR files, financial data, business plans and more. Though content owners and IT departments work together to ensure that data is available only to those who need it, simply setting up all configurations on file servers and leaving them alone is not enough to protect confidential information from unauthorized access. That's why it's a must to constantly keep tabs on file access and monitor user activity on file servers. File access auditing software from Netwrix tracks all file read events across multiple file servers and reports on them, with detailed information about who tried to read which file, when and where the attempt was made, and whether the attempt was successful. This enables organizations of any size to tighten their data security and adhere to compliance regulations. By default, file systems lack any easy-to-use change and configuration auditing and don’t provide any capabilities for file integrity monitoring. Therefore auditing a file system becomes an exhausting manual process. Logging into each server, searching through hundreds of event logs, formatting reports and distributing them on a scheduled basis takes too much time and is prone to error. Netwrix Auditor for Windows File Servers overcomes the limitations of native auditing and automates the manual work by providing comprehensive file system tracking capabilities. By showing who changed what, when and where each change was made, and the current and previous values, Netwrix Auditor transforms complicated audit logs into easy-to-understand information. Lack of proper audit capabilities for file server permissions puts critical data at risk. Accidental or malicious changes to file permissions can lead to unauthorized access or unwanted changes to content, which could result in data loss, interrupted business processes or failed compliance audits. Windows Server file permissions audit software from Netwrix provides a complete picture of the current state of permissions, as well as all changes made to them within a specified time frame. Netwrix Auditor for Windows File Servers helps IT administrators confirm on a regular basis that only eligible employees have access to confidential files and that no file permissions have been changed without their approval. In order to protect business data on file servers and keep storage costs under control at the same time, enterprises need to gain visibility into everything happening on file servers. Who has access to what? Are there any redundant permissions? Which files and folders are no longer in use and can be defensibly deleted? Who owns the largest files? With file analysis software that helps answer these questions, it's much easier to make informed decisions regarding further data management actions. Netwrix Auditor for Windows File Servers provides detailed file analysis reports that enable security professionals and storage managers to better understand their organizations' data structures and their usage, so they can make proactive and well-informed information management decisions. IT professionals are often asked by their manager or auditors to provide comprehensive reports with answers to specific questions about file servers, such as who made permission changes during the last two days. Reporting tools that can provide this detailed information are therefore of the utmost necessity. Because native tools don't deliver any reports, IT admins have to implement multiple scripts to export information about activity in file systems running on Windows Server. The file auditing capabilities offered by Netwrix Auditor for Windows File Servers eliminate all that work. By providing insightful reports on changes and access to files and folders on your Windows Server, as well as file server configurations and file server permissions, the solution simplifies audits and slashes IT workload.